A Las Cruces businessman recently wrote a detailed critique of the business climate in Las Cruces. We at the Rio Grande Foundation have been concerned as well by the political and policy changes happening in the City and how they will impact the economy. The author cites permits and impact fees, water and sewer rates, the gross receipts tax, and finally says the City’s rapidly-rising minimum wage is the most (negatively) impactful. He goes on to list dozens of businesses that have closed shop in Las Cruces recently. It is a great article and worth the short read no matter where you live. But when you actually look at the data it is clear that Las Cruces is not alone. All of New Mexico’s cities lag dramatically behind the regional competition. 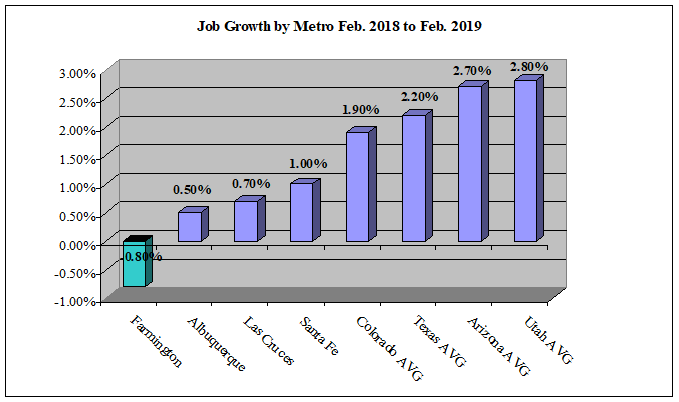 Las Cruces is not doing as bad as Farmington which is struggling even before the San Juan Generating Station closes, but it is not doing great. It would be great if the Legislature were more business-friendly in New Mexico, but cities can have positive or negative impacts as well. The data used in this chart is available here. The problems of Las Cruces are compounded by the fact that it is only about 40 miles from no state income tax and right to work Texas. One would think that such proximity to Texas would cause the political leaders of Las Cruces to moderate their tax behaviour, but the opposite appears to be happening. A taxpayer’s most powerful weapon is his ability to move. That may be all that business owners in Las Cruces can do. SE NM is close to Texas too so we know the competition is fierce. Too bad Santa Fe and ALBUQUERQUE are unaware of the rest of the state. Albuquerque and Santa Fe take all of the money generated from oil, gas and agriculture and give It away as film subsidies and a big give away to Facebook this should be obvious!